This has prompted a number of academic institutions and climate scientists to start publishing on the issue of a 1.5°C goal, with much more likely to come in the months ahead. One such paper (Huntingford, C. and Mercado, L. M. High chance that current atmospheric greenhouse concentrations commit to warmings greater than 1.5 °C over land. Sci. Rep. 6, 30294; doi: 10.1038/srep30294 (2016).) was reported on recently by the BBC, under the heading Debate needed on 1.5C temperature target. . . . . current warming is around 1.1°C since pre-industrial times, but that there is more to the story than this. The climate system is not at equilibrium, with the oceans still lagging in terms of heat uptake. Therefore, if the current level of carbon dioxide in the atmosphere was maintained at some 400 ppm, the surface temperature would rise by another few tenths of a degree before the system reached an equilibrium plateau. There is strong evidence that even for current levels of atmospheric GHGs, there is a very high probability that the planet is committed to a mean warming over land greater than 1.5 °C relative to pre-industrial times. Such warming could be greater than 2.0 °C, and in particular for large continental regions away from coastlines. While a debate about the global goal wasn’t a feature of the paper itself, the BBC interviewed the authors and reported that while they believed it to be a good idea to have an “aspirational” 1.5°C goal in the Paris agreement, that nevertheless if the world is to take 1.5°C seriously, then a serious discussion needs to be held about the implications of that goal. The author of the paper is quoted as saying “I think there needs to be a very thoughtful debate about what’s to be gained at these different temperature levels, if approaching the lower levels meant severely damaging the economy,”. Such a discussion has been largely absent, replaced with a somewhat myopic focus on 2°C and now “well below 2°C, with a view to 1.5°C”. I discussed this at some length in my first book, drawing on the work of the MIT Joint Program in their 2009 report Analysis of Climate Policy Targets under Uncertainty. In that report the authors demonstrated that even a modest attempt to mitigate emissions could profoundly affect the risk profile for equilibrium surface temperature. This is illustrated below with five mitigation scenarios, from a ‘do nothing’ approach (Level 5) to a very stringent climate regime (Level 1). An important feature of the results is that the reduction in the tails of the temperature change distributions is greater than the shift in the temperature goal (represented by the median of the distribution). For example, the Level 4 stabilization scenario reduces the median temperature change by the last decade of this century by 1.7 ºC (from 5.1 to 3.4 ºC), but reduces the upper 95% bound by 3.2 ºC (from 8.2 to 5.0 ºC). In addition to being a larger magnitude reduction, there are reasons to believe that the relationship between temperature increase and damages is non-linear, creating increasing marginal damages with increasing temperature (e.g., Schneider et al., 2007). These results illustrate that even relatively loose constraints on emissions reduce greatly the chance of an extreme temperature increase, which is associated with the greatest damage. But the other focus of the Paris Agreement stands apart from such debate. As previously discussed in several postings, Article 4 calls for a balance between anthropogenic emissions by sources and removals by sinks of greenhouse gases in the second half of this century, i.e. a state of net-zero emissions. In fact such an outcome is eventually required irrespective of the temperature outcome; without it warming continues. Net-zero emissions arguably brings a more practical focus to the task of emissions mitigation. It defines an end-point and allows a discussion on the pathway there, the types of technologies required and the shape of the energy economy once achieved. 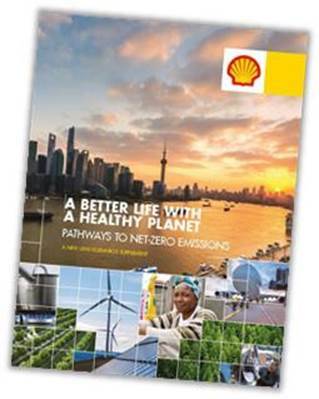 All of this features in the new supplement to the Shell New Lens Scenarios, A Better Life with a Healthy Planet: Pathways to Net-Zero Emissions. Scenarios are part of an ongoing process used in Shell for more than 40 years to challenge executives’ perspectives on the future business environment. They are based on plausible assumptions and quantification, and are designed to stretch management thinking and even to consider events that may only be remotely possible.